I look over at Sadie’s mom, hoping to see a smile to indicate she’s joking — but she’s stone-faced. Dead serious. I’m shocked and embarrassed for her. My 4-year-old son is within earshot, and I’m hoping he didn’t hear her rude remarks. We are at a birthday party. He should be having fun, not facing criticism for being a boy. At that particular moment, my boy is neither stinky nor loud. His mouth is full of cupcake, making him pretty quiet. And since he bathes regularly, I can personally attest to the fact that his stink factor is very low. But she’s clearly not talking about my son, she’s talking about all of our sons. And she’s not alone. This is not the first time I’ve been on the receiving end of a girl’s mom maligning every little boy that has ever, or will ever, exist. I hear it all the time. You moms of girls always unapologetically describe boys’ behavior in the pejorative. And you do it aloud. 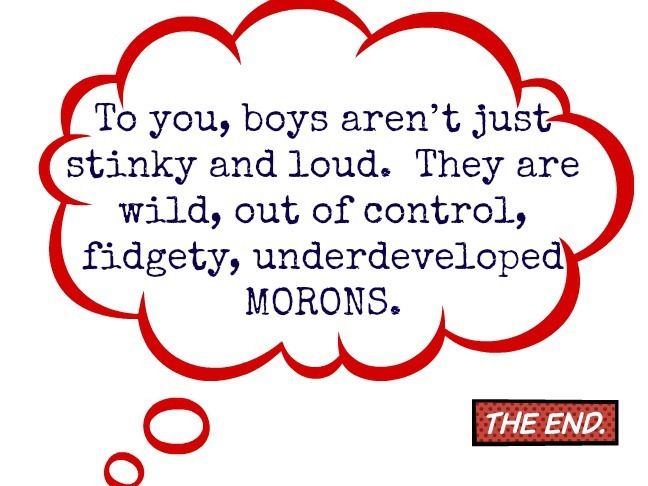 To you, boys aren’t just stinky and loud, they are wild, out of control, fidgety, underdeveloped morons who will grow up to be stinky, loud, wild, out of control grown morons. Even worse? You have absolutely no problem letting us moms of boys, and our sons, know that you disapprove of our boys’ behavior. But here’s the thing: Its total BS and I’m so over it. I can’t imagine moms of boys ever standing around a birthday party or park date, telling our sons, “Don’t play with those girls. They’re catty and whiney!” Boy moms don’t roll our eyes when your daughters are clinging to your leg and crying. 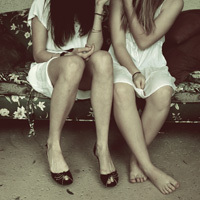 Nor is there any time we’d think to categorize every girl without having met her. We just don’t do it, but you do. So just know that not only are us moms of boys listening, so are our sons and so are your daughters. You are shaping how our boys see themselves and how they perceive that others see them. And you are telling your daughters that whatever you’ve deemed as “boy behavior” is actually bad behavior. So if you want to know what’s true about little boys, I’ll tell you. Little boys are sometimes loud. And sometimes they’re not. Some little boys don’t smell good. Sometimes their sisters don’t either. And sometimes some boys like to (or need to) fidget and move around. That doesn’t make them wild, that makes them human. Your little girls may not be stinky, but your behavior stinks. Maybe it’s time you adopt the same manners you’ve been hopefully teaching your children. If you don’t have anything nice to say, don’t say anything at all. And for the record, my daughter is much louder than my son.